It’s Valentine’s Day and crafting an amazing, board-game filled date night can be easy and fun. All you need is your playmate, a generally flat surface, and a pile of your favorite shared games to make for an awesome evening of gaming fun! But maybe you want to take things a bit further. Maybe, instead of a playful, light affair, you’re looking for deeper, more meaningful board game connections. Well, have I got a list for you! Here are 5 great games that might help you not just play together, but actually develop a closer connection with your playmate. And hey, this isn’t just about romance – platonic relationships of all sorts can have fun with the following awesome games for 2! A silly little card game about animals playing music doesn’t sound very thought provoking does it? And yet, Okey Dokey can be a fun way to learn more about how your playmate communicates and foster trust between each other. 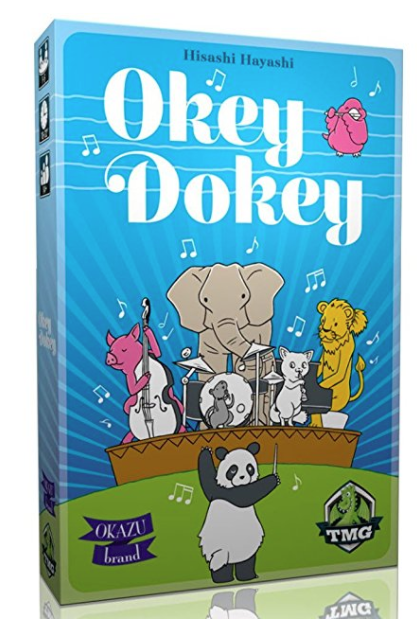 Okey Dokey is a cooperative, hand management game where players are trying to coordinate several animal musicians by placing all 50 cards in the deck into 10 columns. Cards must be played according to the placement rules (1 color per column, numbers in descending order, columns must be completed before making a new row). This is easier said than done as players must keep their hands a secret and can only communicate how many cards they have of a color to suggest which color they would like their partner to play. The first few placements are easy, but as the game progresses and your options are becoming more and more limited, you’ll start trying to psychically communicate with your partner which numbers you need the to place vs which will doom you both to a resounding defeat at the music festival. Each time you play, you’ll get better at seeing how your partner judges risk and how they communicate what they have in their hand: Do they look stressed? Are the emphasizing any words as they speak? What kind of tactics have they used in the past? As you both get better at Okey Dokey you’ll learn to trust your partner more and take heart in their decisions (at least until they play that 1 in the middle of the game and the discordant note throws everything into chaos. Then you’ll learn some lessons on forgiveness). 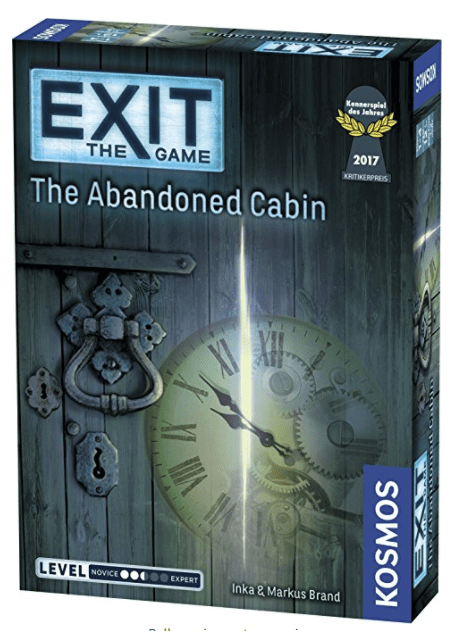 The Exit series, by Inka and Markus Brand, are fantastic “Escape Room” style games that promote the sharing of ideas and learning to work together. Each Exit game sets you in a different scenario: locked in a cabin by a serial killer, trapped in an ancient Egyptian tomb, or the subject of a suspicious medical experiment. Your goal is to escape the situation by solving puzzles using the clues that the game contains. Some of the puzzles are easy and will take no time to sort out, but others will challenge you and this is where teamwork becomes important. Learning about your partner’s strengths and weaknesses will help when divvying up the work. For example, when Andrew and I play, he is great at relational logic (how things fit together), linear problem solving, and observation, whereas I focus more in creativity/non-linear problem solving, logic puzzles, and code-breaking. No matter how clever we are, if we tried to play these games solo, it would take a lot longer and some puzzles might just stump us. Together, we can look at things from different angles and come to solutions we might not have thought of apart! Exit thrives on teamwork. Collaborating over difficult problems and laughing at the obviousness of the answer when you find it are some of the delights that you’ll share when playing. 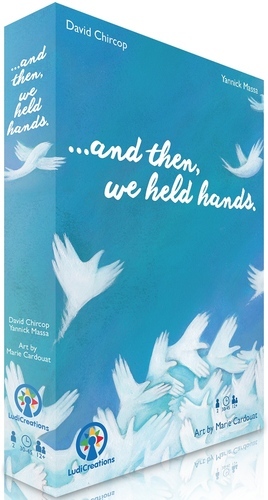 …and then, we held hands is a game all about communication. 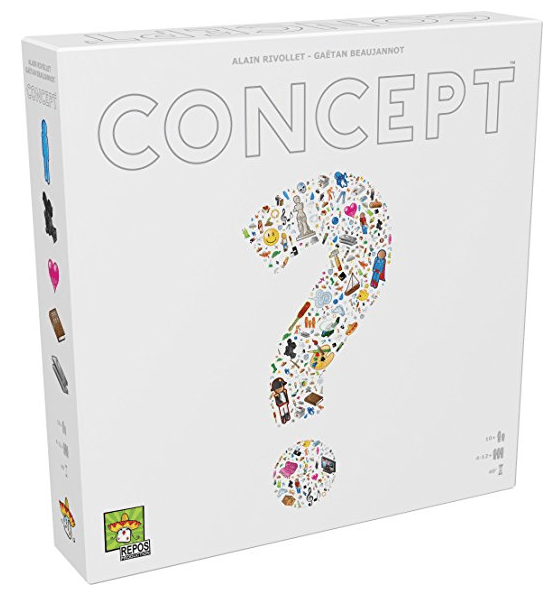 Two players will work together to complete objectives and have their pieces reach the center of the board. To move your piece you’ll play cards that will affect both pieces, thus trying to play cards that benefit both players is crucial. The major challenge is that both players cannot verbally discuss the game..at all. While it may not seem important, this is a key rule for our objective of building better relationships. How many times have you shared a space with your playmate, playing on your phone, delving into a bottomless hole of information on the internet, or otherwise doing your own thing without really talking face to face? …and then, we held hands is more than just an interesting thinkpiece of a game, it is an excuse to spend time talking to each other. You might not know what to say at first. Perhaps this might even be the first time you are really getting to chat with your playmate (think first date material). This game forces you to find something to say. It can be as light as discussing your favorite cartoons or as deep as discussing how those childhood cartoons deeply scarred you for life (I’m looking at you G.I.Joe’s Shipwreck episode). I think …and then, we held hands didn’t work for us because Andrew and I have known each other for around 18 years and we’re pretty comfortable talking about everything and anything, so we spent more time focused on the gameplay than the discussion. I think if you don’t make our mistake, this game could be a good way to spark discussions you might not have thought to have before and communication is a foundation for any good relationship. If you really want to get to know your playmate, you gotta learn how they think; how they put ideas together and make associations. Concept is perfect for this. it is essentially a game of charades except you are using images and tokens to represent ideas. Each round you’ll have to choose an idea from any of the 3 difficulty levels and then give your partner clues by placing your pieces over pictures on the board. How you place pieces and how many pieces you place can be part of the clue. This kind of game is great for highlighting shared experiences and the things that stand out to you and your playmate. The performative part of Concept where the clue giver tries to communicate with limited options can make for a unique sort of shared storytelling and of course Concept is a team game, so you can expand the experience to more than just you two. Citadels isn’t like the other games on this list – it’s not at all cooperative, has no teams, and can be incredibly cut-throat. But what’s really interesting about Citadels is how differently it plays at 2 players than at any other player count. This role selection game is awesome no matter how many people play it, but at 2 players, it becomes a very different experience; the interaction between you and your playmate means that you’re constantly trying to out-guess what their next move will be, leaning hard into your knowledge of their personality and gameplay style – especially since in the 2 player game, you will both be drafting two roles per round, rather than just one. At the same time, of course, they will be doing their best to think around your strategy, as well as what you know about them, so we get a bit of ‘well I know that she knows that I know that she knows…’. 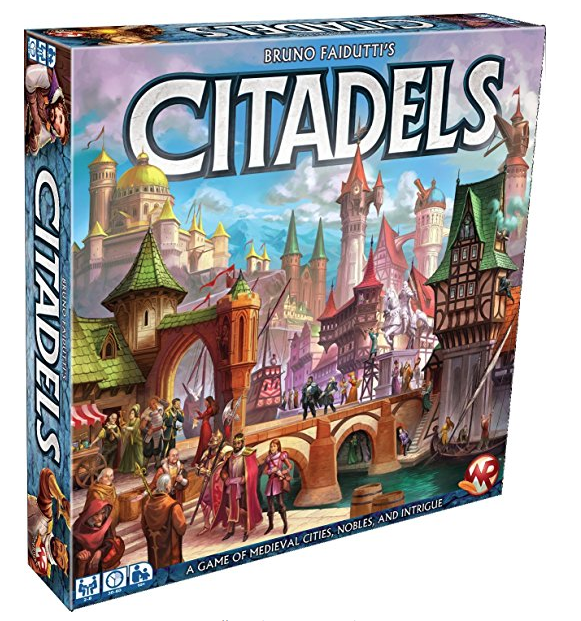 And unlike regular Citadels, where you can sometimes just put your head down and hope no one notices what you’re up to, in 2 player Citadels, you are constantly being scrutinized by your partner; the added layer of strategy and challenge really changes the tenor of the game, and makes for a truly engaging experience. These are our 5 picks for games to help explore and build up your relationships. Which games do you think help you build bonds with others? What aspects do they encourage? Let us know in the comments below!